Early morning in the Tropical High Elevation House --it's one of my favorite refuges. The air is cool and the sound of the waterfall is tranquil. After a hair-raising commute in Atlanta traffic, it is soothing. Like being in Ecuador again. Fallen logs are a common sight if you are hiking in an Ecuadorean forest. They sometimes carry a treasure load of epiphytic plants--orchids, bromeliads, begonias, gesners--plants that you normally see only through binoculars. To achieve the fallen-log effect in the HEH, we selected a 7' driftwood branch, mounted epiphytic orchids on it, and placed it at an angle in front of the waterfall. The base rests on the stream bank and the tip leans toward the face of the waterfall. 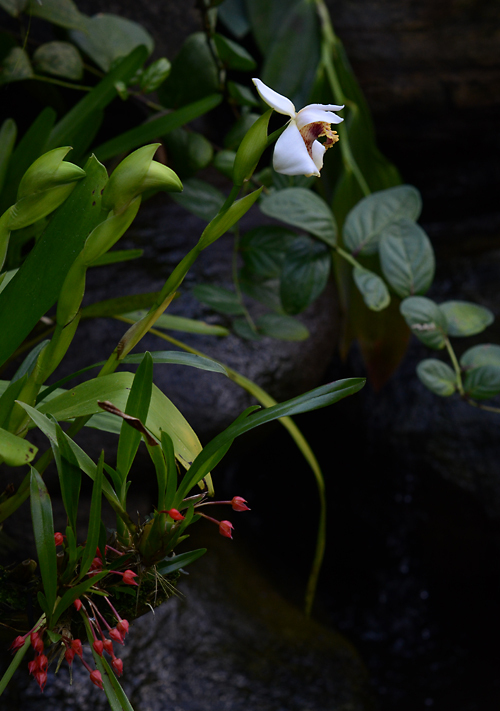 After a year, the orchids are established and starting to flower. This month four species of Maxillaria are flowering simultaneously. 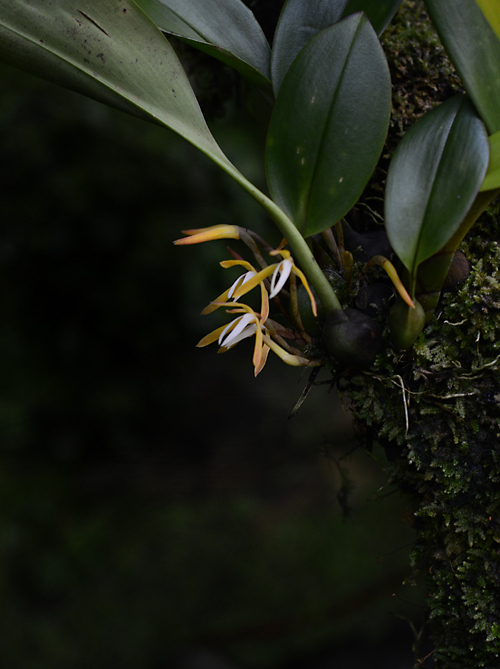 Maxillaria lehmannii, with the regal white flower grows as an epiphyte in wet montane cloud forests in western Ecuador and Peru. 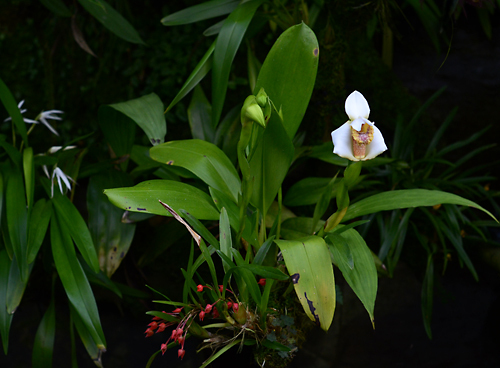 To its left, is the adorable Maxillaria coccinea, with coral flowers. It grows in Colombia, Venezuela, Brazil and the Caribbean at 500 to 1000 meters. It doesn't seem to mind the cool temperatures in the HEH. Closer to the base is Maxillaria c.f splendens, with nodding elongated flowers. M. splendens comes from Peru, where it grows as an epiphyte at 2000 meters elevation. And finally, my mystery Maxillaria, source unknown, nicely embedded in the moss carpet that is overtaking our branch. 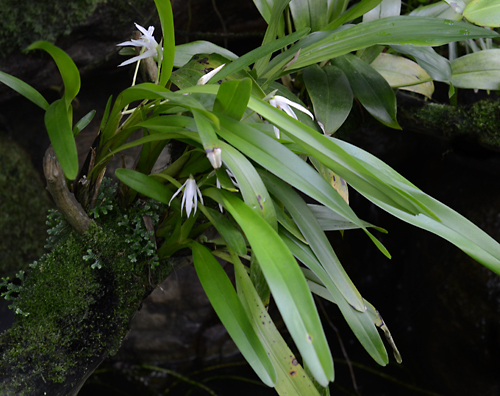 Don't forget to visit the Tropical High Elevation House when you are visiting the Fuqua Orchid Center!